Paella is one of the best known dishes from Spain, although it is really from the Spanish city of Valencia on the Mediterranean coast. 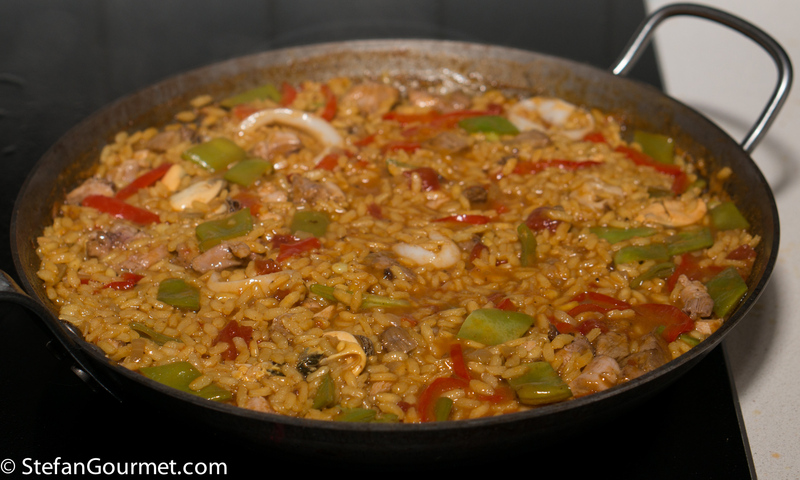 The name “paella” simply means “pan” in Valencian, although a paella pan is called a “paellera” in Spanish. 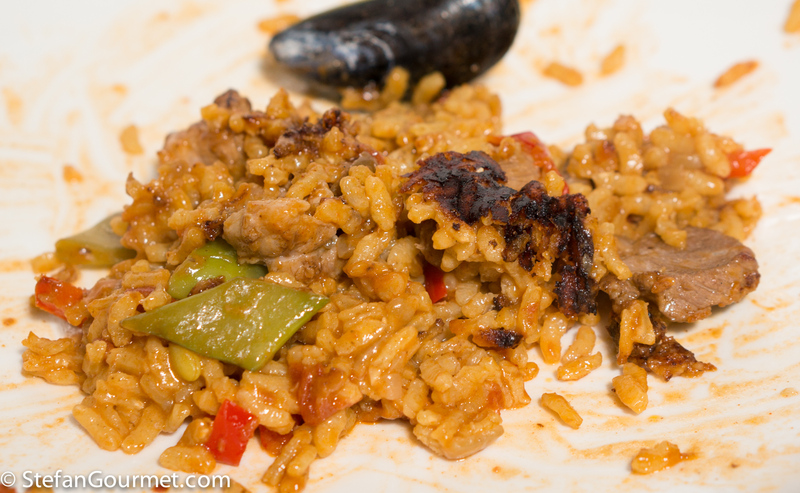 There are many versions of paella, some more authentic than others, which is why Valencians think those other dishes should be called “arroz con cosas” (rice with stuff). 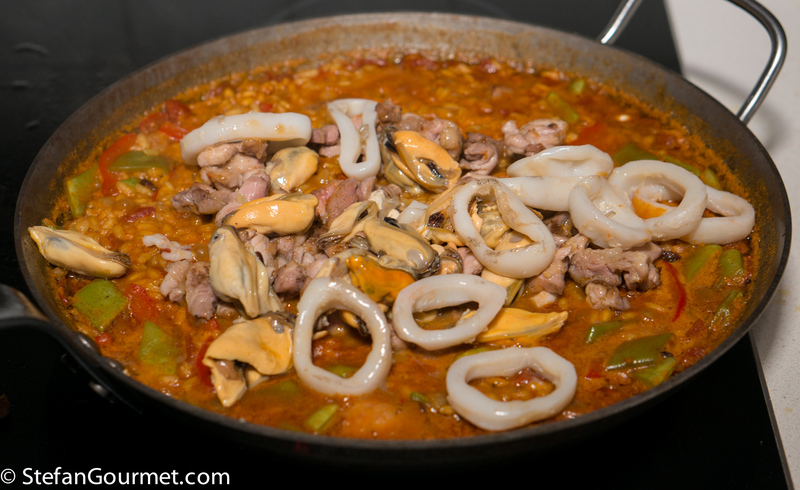 The main versions are Paella Valenciana (meat paella with chicken, rabbit, and snails), Paella de Mariscos (seafood paella with shrimp, mussels, squid, scampi, and fish), Paella de Verduras (vegetable paella with runner beans, white beans, and artichokes), and Paella Mixta (mixed paella with meat, seafood, and vegetables). Although there are a lot of variations, chorizo is not considered to be a traditional ingredient, so paella with chorizo would fall under the “arroz con cosas” category. 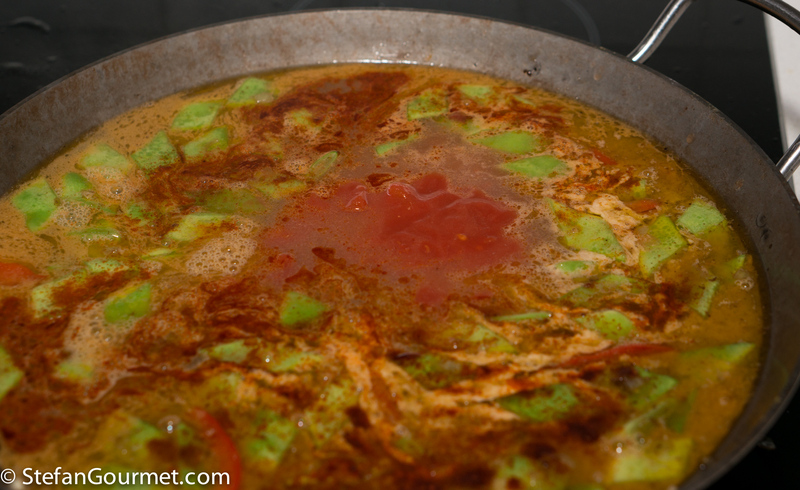 When making paella, the stock is very important, as that is what will flavor the rice. 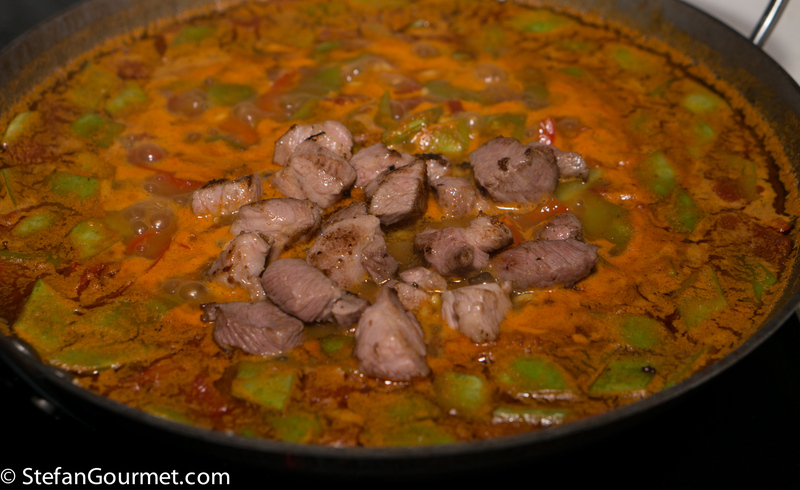 For this mixed paella I have also used a mixed stock: chicken stock, shrimp stock, and mussel cooking liquid. Paella was traditionally colored with saffron, but nowadays it is often substituted by food coloring because saffron has become so expensive. Luckily I just returned from Italy, where powdered saffron is still affordable. Although I have chosen traditional ingredients to make this Paella Mixta, I am ‘cheating’ a bit with the cooking technique to get an even better result. 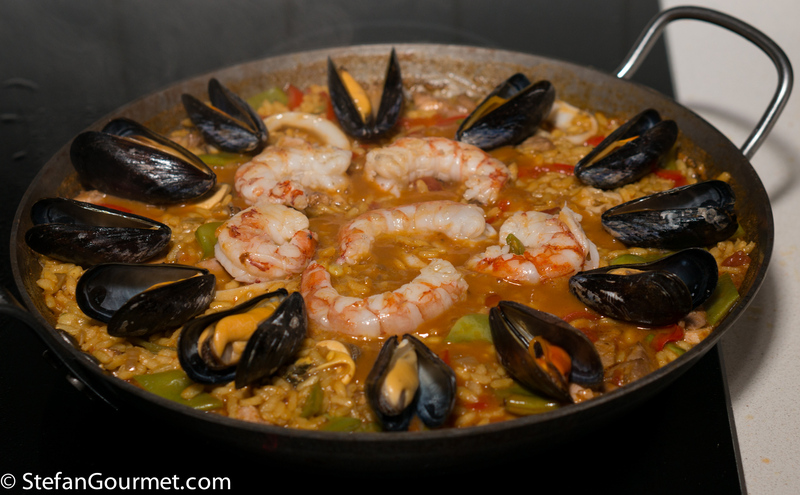 The traditional way of preparing paella is to cook all the ingredients together and to refrain from stirring. 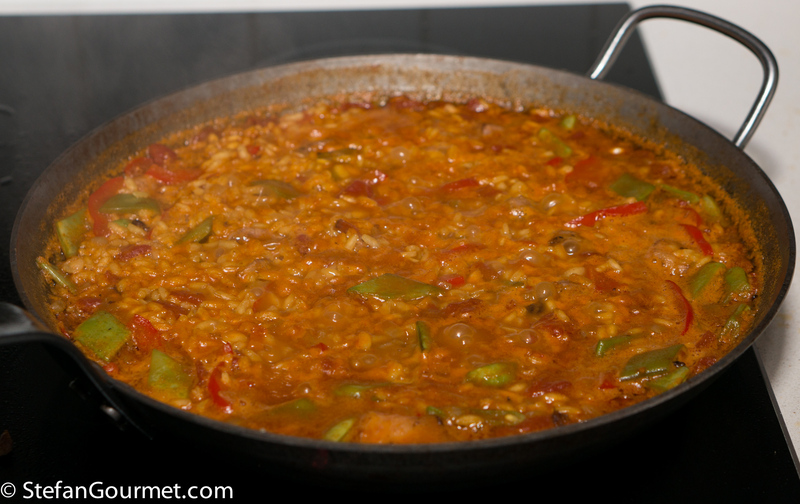 This creates optimal conditions for the “socarrat” to form, a layer of toasted rice at the bottom of the pan that adds an additional layer of flavors and textures to the paella. But it comes at the price of overcooked (dry) meat and seafood. In the recipe below I have compromised between cooking the meat and seafood correctly and still creating somewhat of a socarrat. Another difference with most recipes is that I peel the shrimp before cooking. This has two advantages: (1) it allows us to make a stock out of the heads and shells, which adds a lot of flavor to the rice, and (2) your guests won’t have to peel the shrimp. The only drawback is that unpeeled shrimp look better, but I think that is a small price to pay. 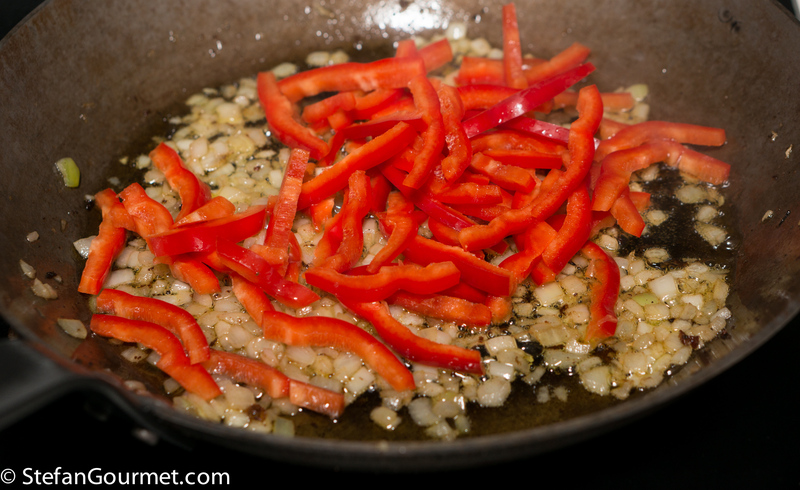 Of course it is best to use a real paellera, but a frying pan of a similar shape with good heat distribution will do. …until the mussels have opened up. 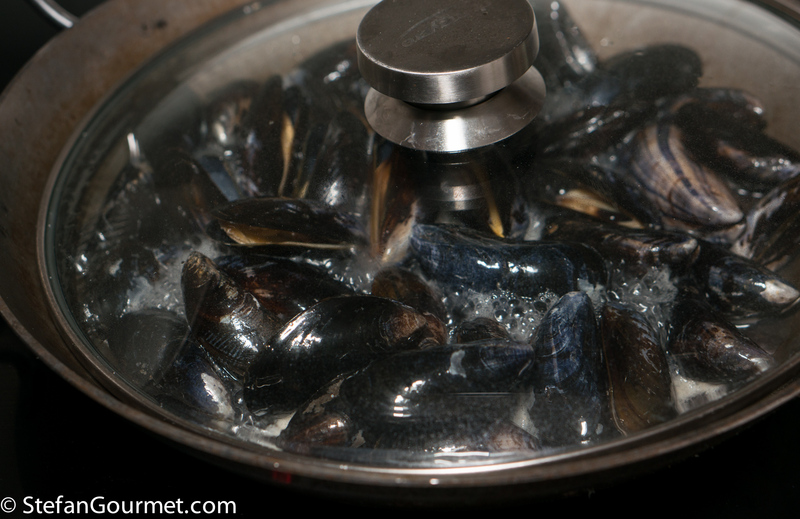 Strain the mussel cooking liquid and reserve both mussels and liquid. 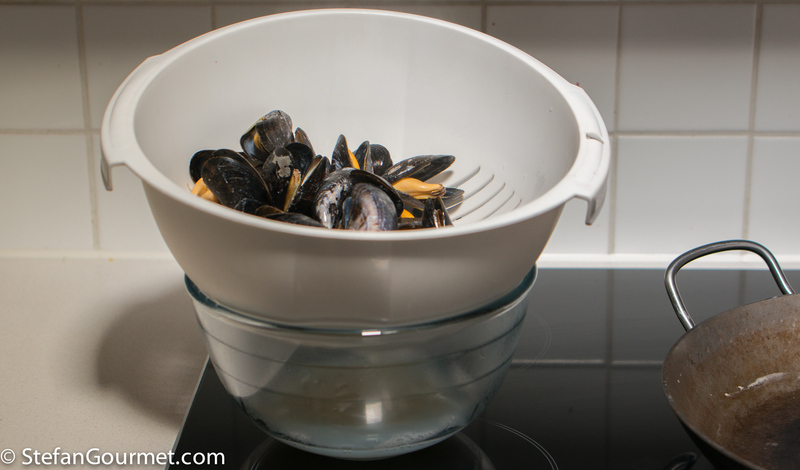 Filter the mussel liquid using kitchen paper. 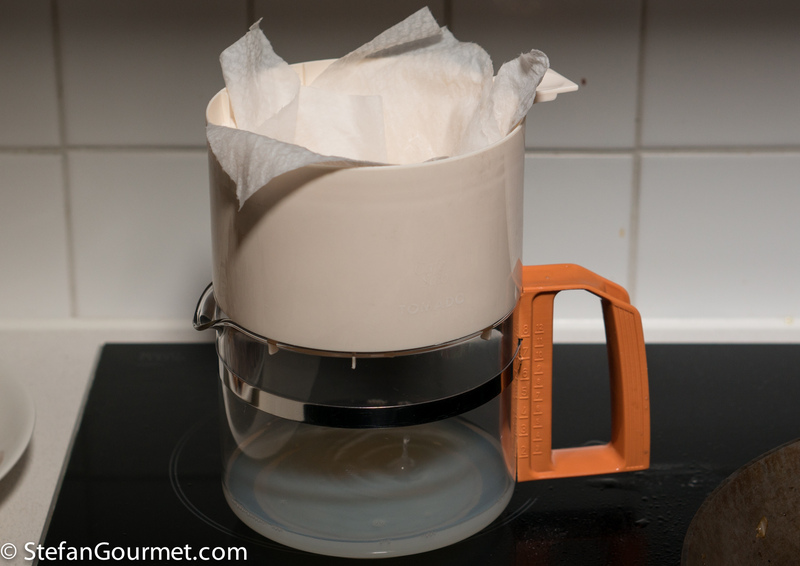 (I like to use an old coffee filter holder for this.) 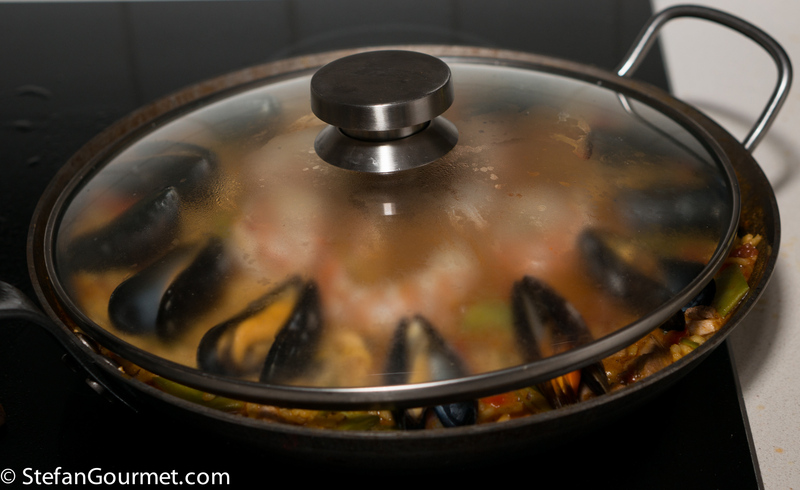 Add the mussel liquid to the chicken stock. Select 12 nice looking mussels in their shell, and reserve them. 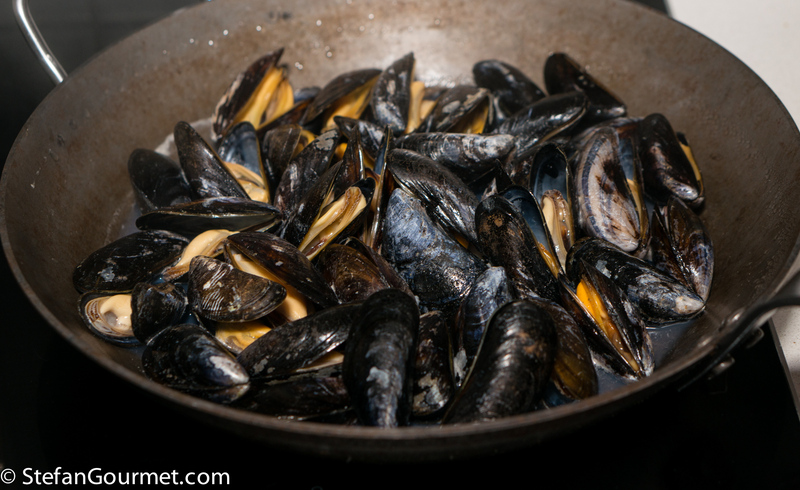 Take the other mussels out of their shells, and reserve. Peel the shrimp, reserving heads and shells. Cut the squid into rings. 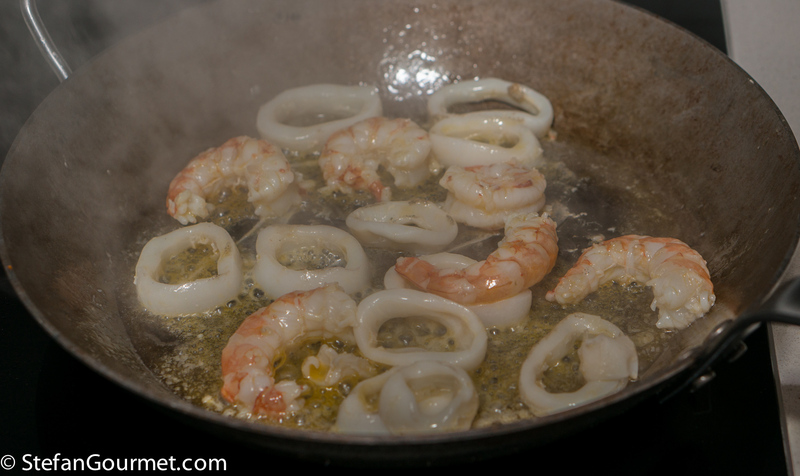 Sauté the squid and shrimp for 1 minute in 2 tablespoons of olive oil over high heat. 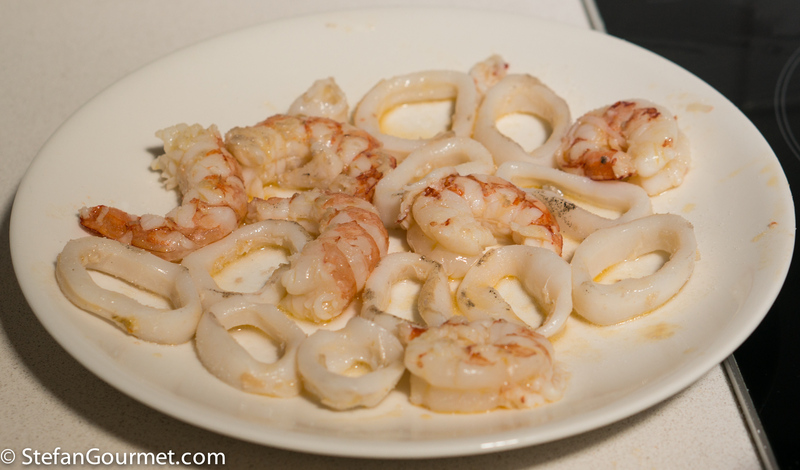 Transfer the seafood to a plate with a strainer, and season with salt. 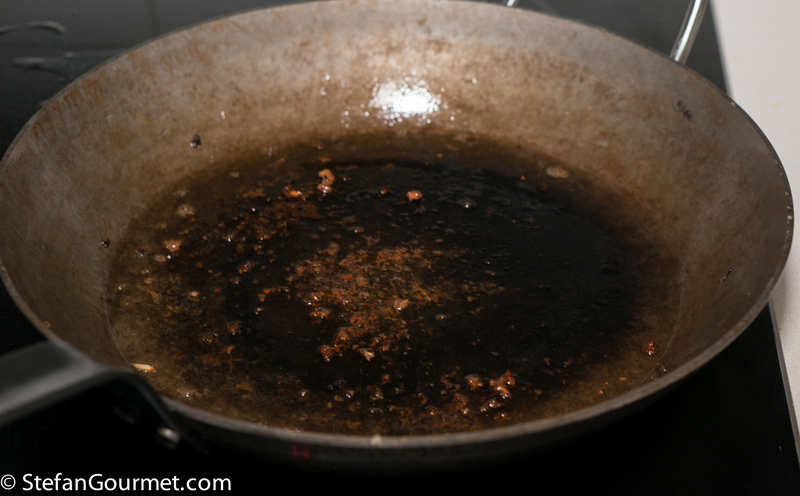 Do not clean the pan, as the seafood drippings that were left behind contain a lot of flavor. 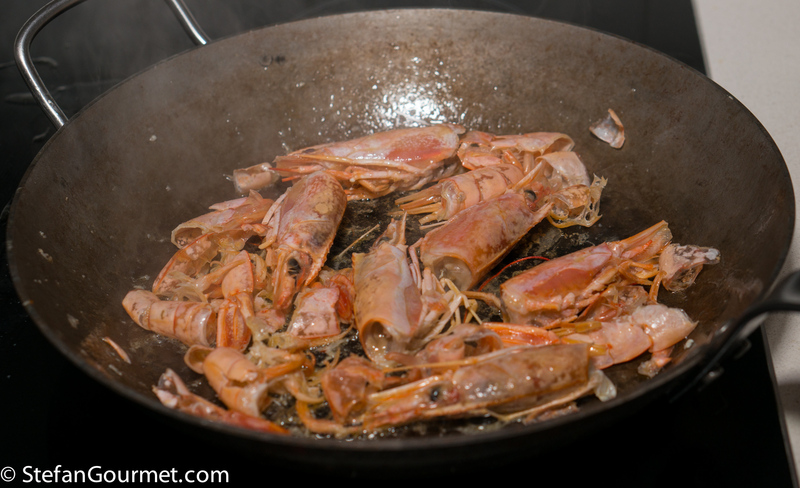 Add the reserved shrimp heads and shells to the pan, and stir them briefly over high heat. 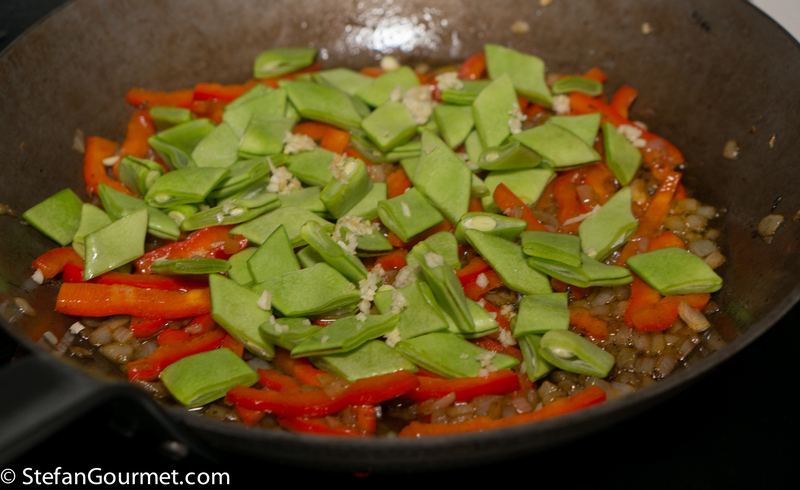 Add 1/2 litre (2 cups) of water, and scrape the bottom of the pan with a wooden spatula to include all the flavor. 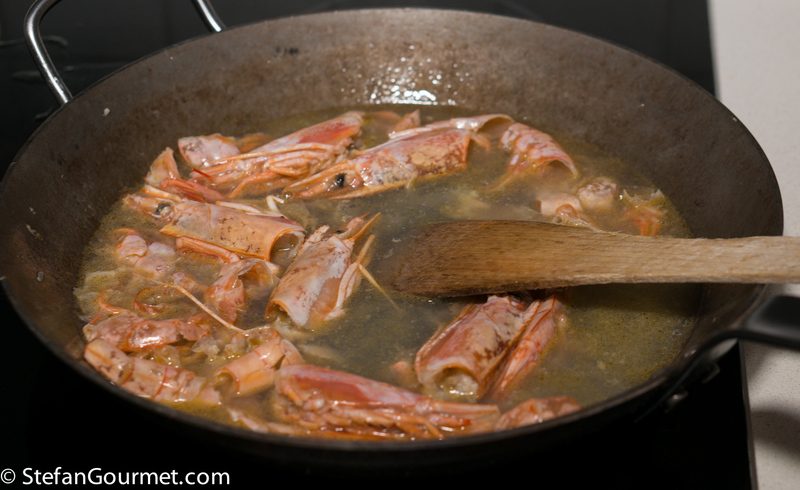 Now transfer the contents of the pan to a smaller pot, such that the liquid will cover the shrimp heads. 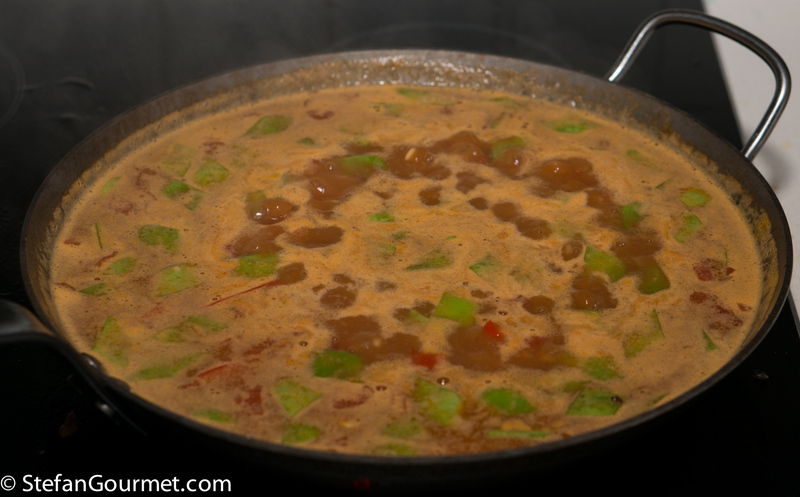 Bring to a boil, then reduce to a simmer, and simmer for 20 minutes. 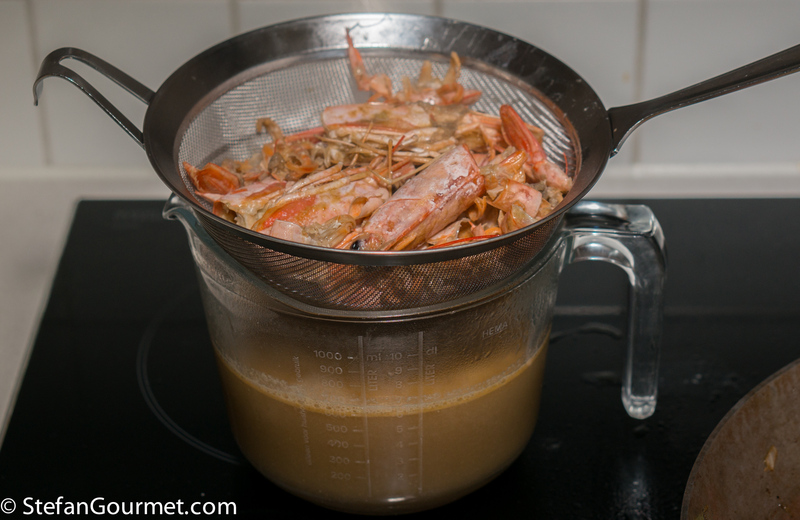 After those 20 minutes, strain the shrimp stock through a sieve and add it to the chicken stock. 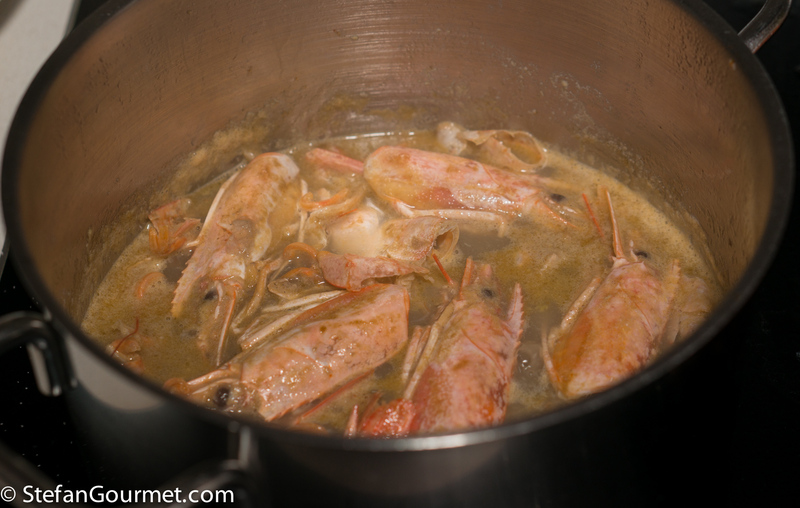 Use a chinois and a pestle to push as much liquid out of the shrimp heads and shells as you can, as there is a lot of flavor in there, and add this to the stock as well. 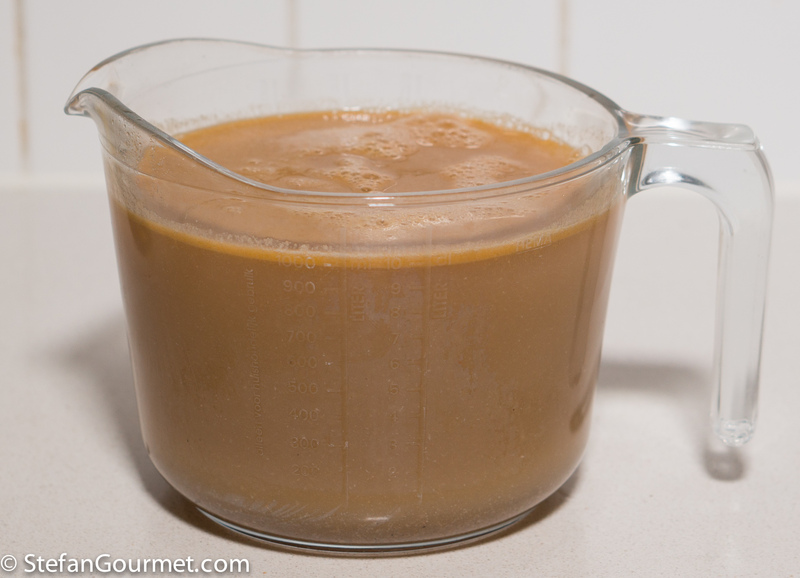 If all went well, you should now have 1 litre (4 cups) of stock. 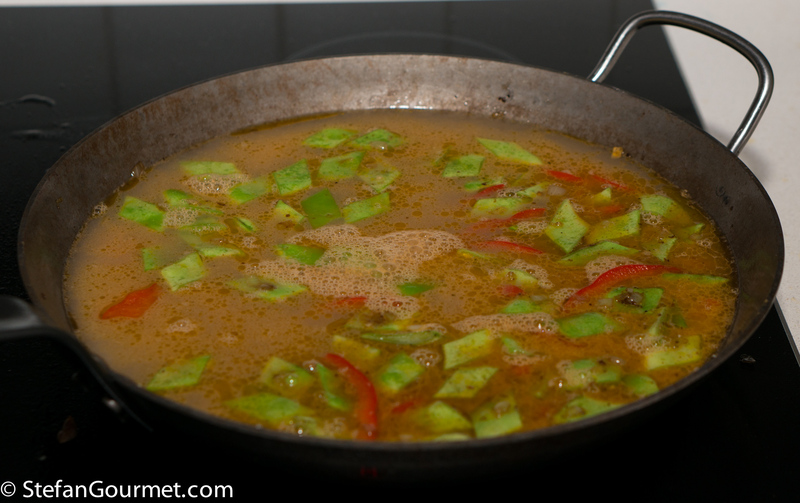 If you have too much, simmer it to reduce it to 1 litre. 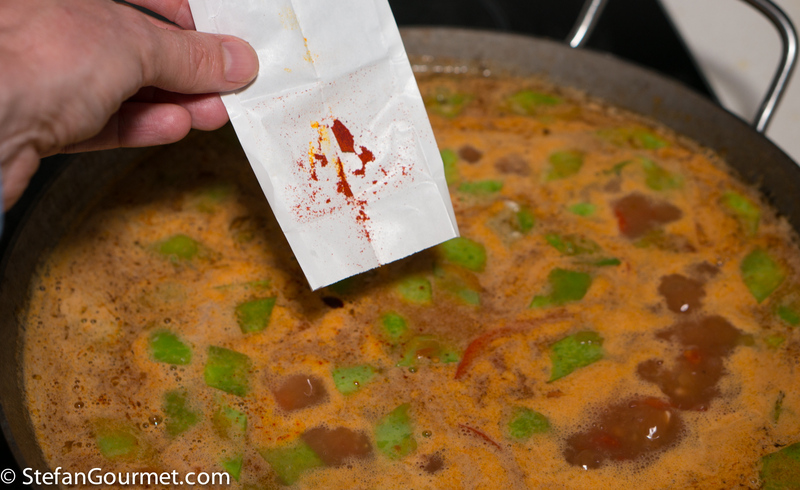 If you have too little, add some water or chicken stock. 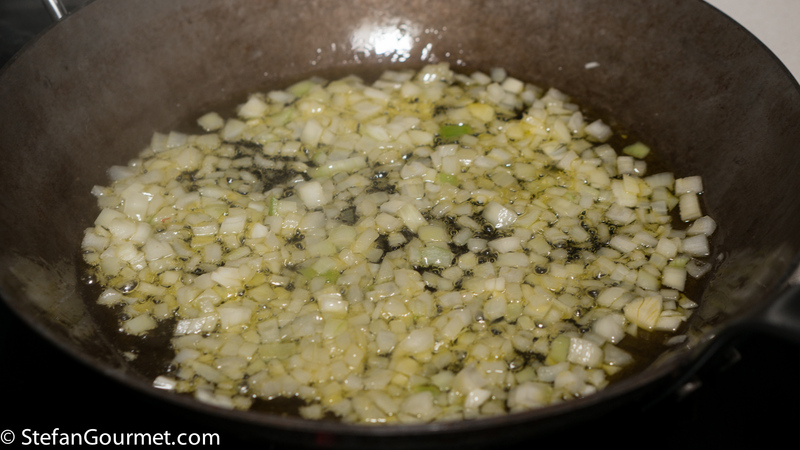 In the meantime, cut the chicken into pieces and sauté this for 1 minute over high heat in 2 tablespoons of olive oil. You don’t have to cook the chicken through, this step is just about browning the chicken a little to add some flavor. 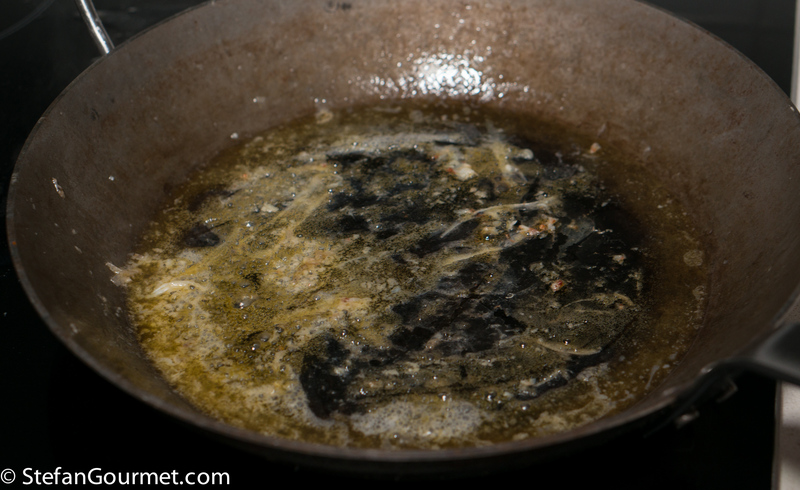 As soon as it starts to turn golden, lift the chicken out of the pan using a strainer and set it aside on a plate. Cut the pork into pieces. 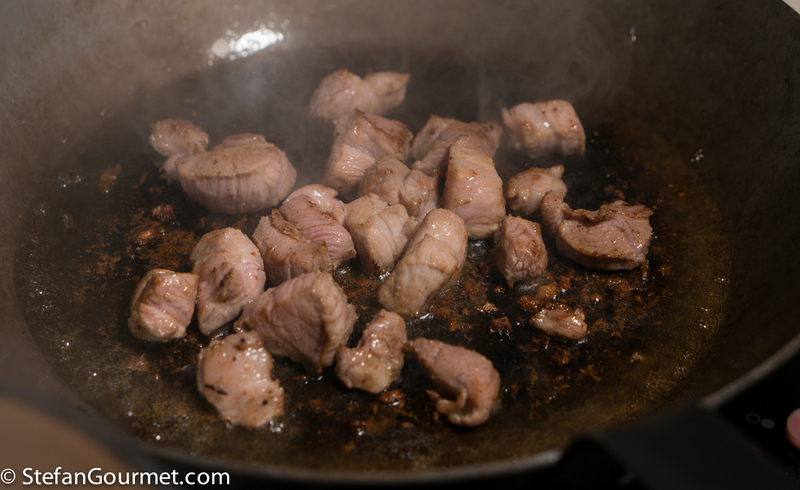 Sauté the pork in the same pan as the chicken, without cleaning it, for 1 minute over high heat. Add a bit more olive oil if needed. 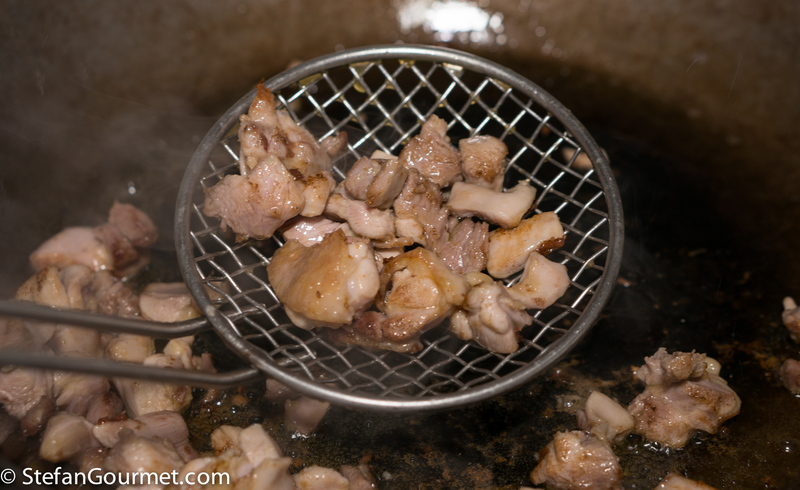 Again, this is just about browning and not about cooking the pork through. 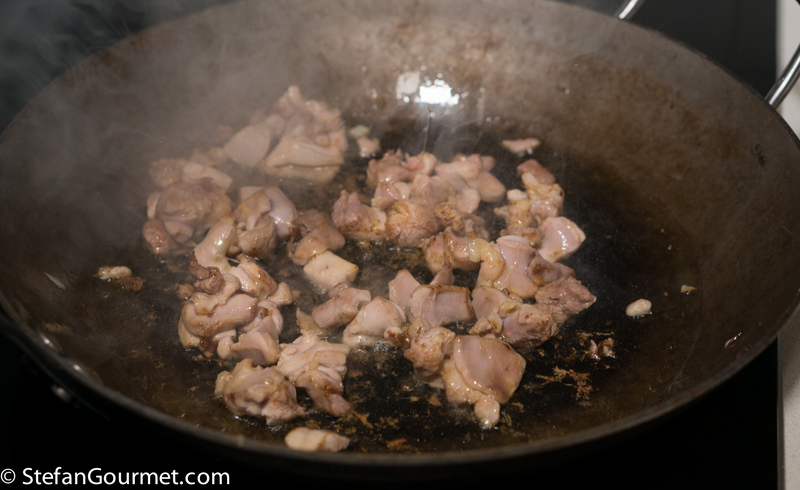 As soon as the pork has some browned edges, lift it out of the pan and put it aside on a plate next to the chicken (making sure to keep them separate). Season both of them with salt. Again there will be a lot of nice brown bits left in the pan. Do not clean the pan. 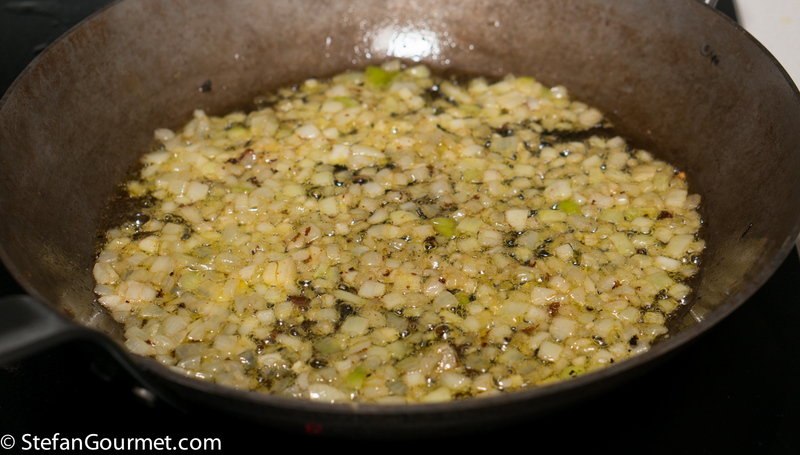 Add the chopped onion and season with salt. 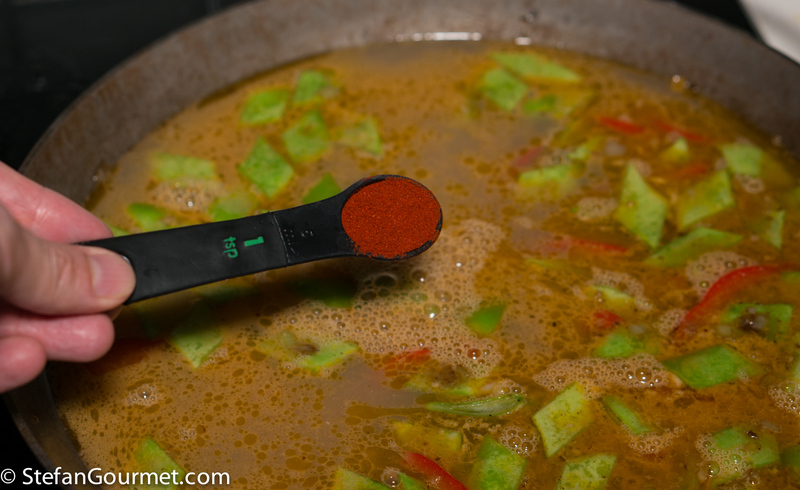 Cook over medium heat and stir with a wooden spatula to pick up all the flavor from the pan. 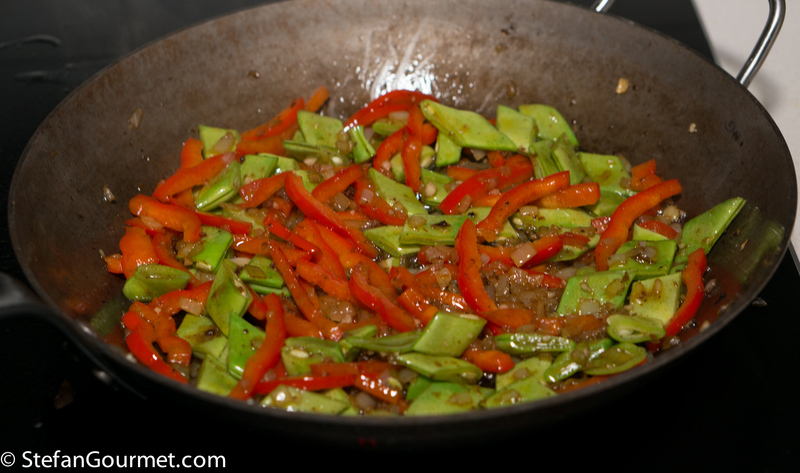 Add the red bell pepper strips and stir for a couple of minutes over medium heat. Add the runner beans and the garlic. Stir for a minute over medium heat. And a teaspoon of paprika. Stir, then bring to a boil. Once it boils, lower the heat so that it keeps boiling gently. 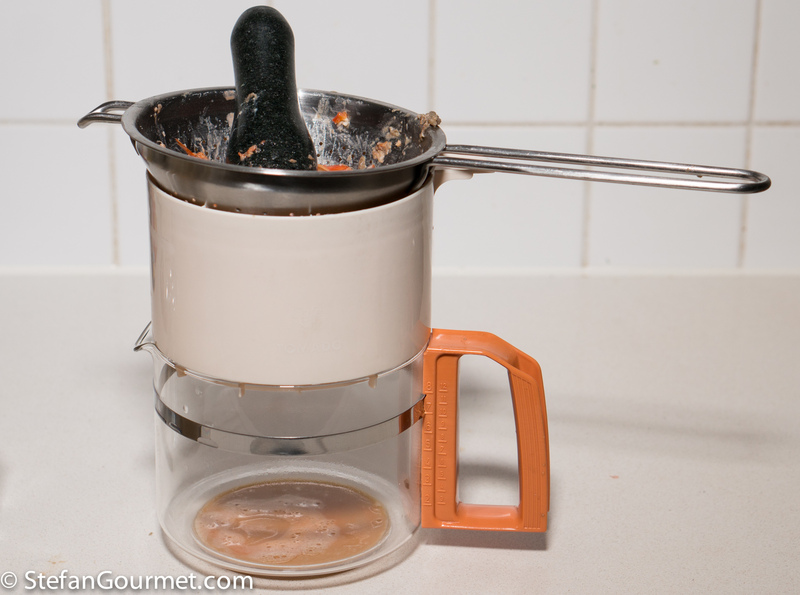 …and stir to incorporate. 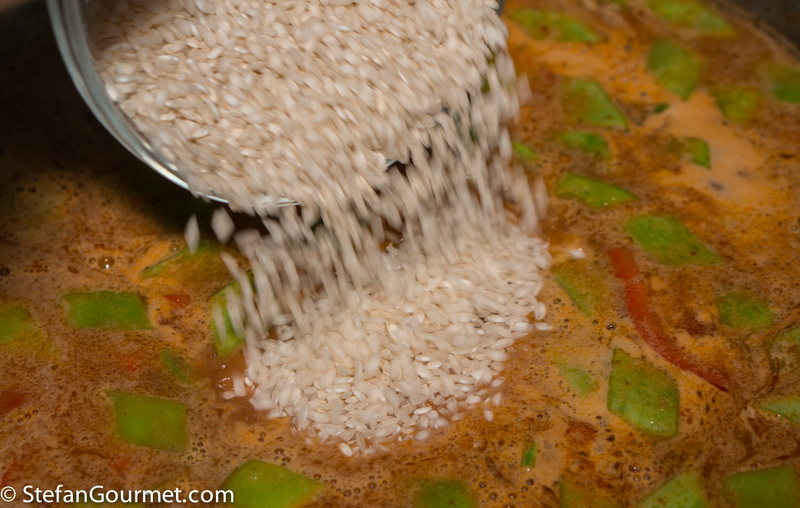 Continue to simmer for 10 more minutes. …and the squid and mussels that were taken out of their shells (together with any juices on the plate). Arrange the mussels in their shells and the shrimp on top. Cover and cook over medium heat for 5 minutes longer. Turn the heat to low, and allow to rest for 5 more minutes to allow the remaining stock to be absorbed and a socarrat to form. This will be great with many dry white wines, and a Spanish one such as Albarino, Rueda or Godella, would be most appropriate. 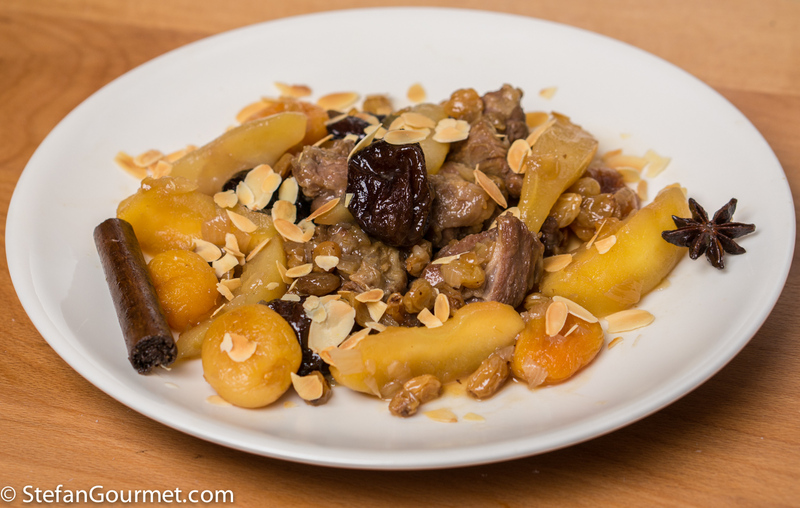 Lham Lahlou is an Algerian dish of lamb stewed in a sweet syrup with fruit and spices. 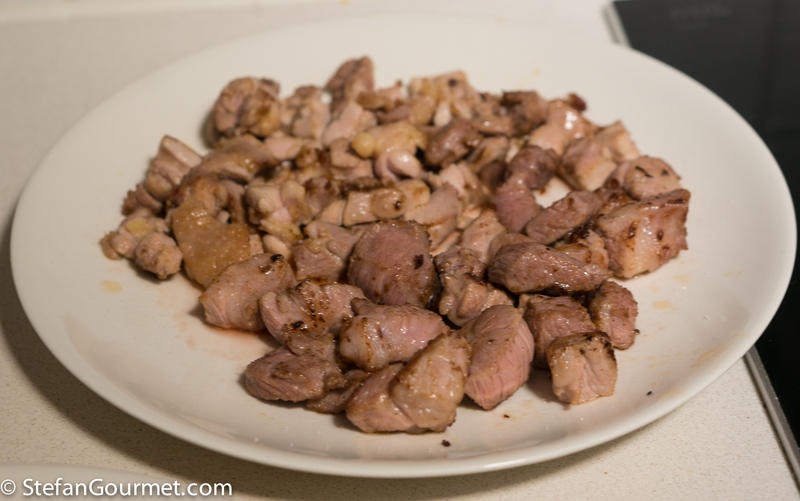 Of course I could not resist to prepare it sous-vide, and it turned out delicious. My favourite kind of paella! What size is your pan? I really need to buy one but not sure as to size. The bottom diameter is 24 cm, the top diameter is 32 cm. Have the biggest smile in the world on my face – if you move in the same blog circles as I you will know why!! Thank you for a wonderful lesson – yes, I also use stock and love your version. Must admit I have not usually stirred to get the soccarat, but your ‘half-and-half’ reasoning makes sense and shall also be tried next time around: spring arriving, this is a perfect outdoors dish . . . This seems to be the week for new formats in the blogosphere – like yours very much . . . . 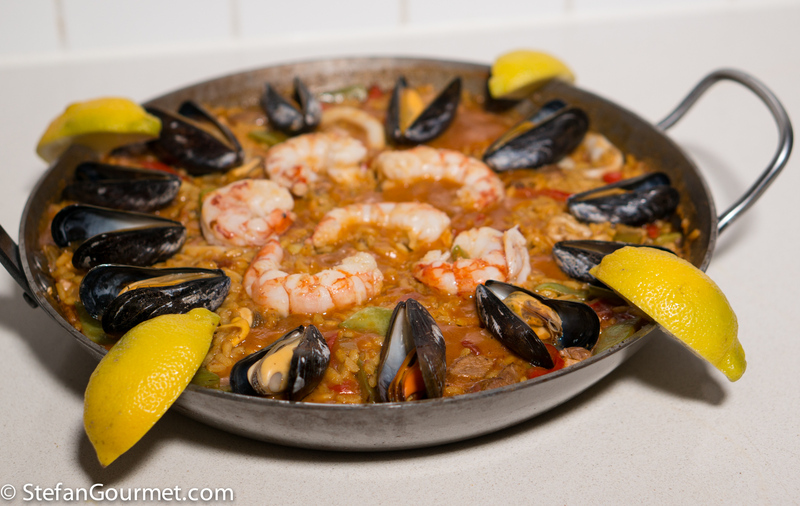 I love a good paella – and yours looks fantastic! OMG this looks amazing, makes me so hungry just looking at it! Nice one! 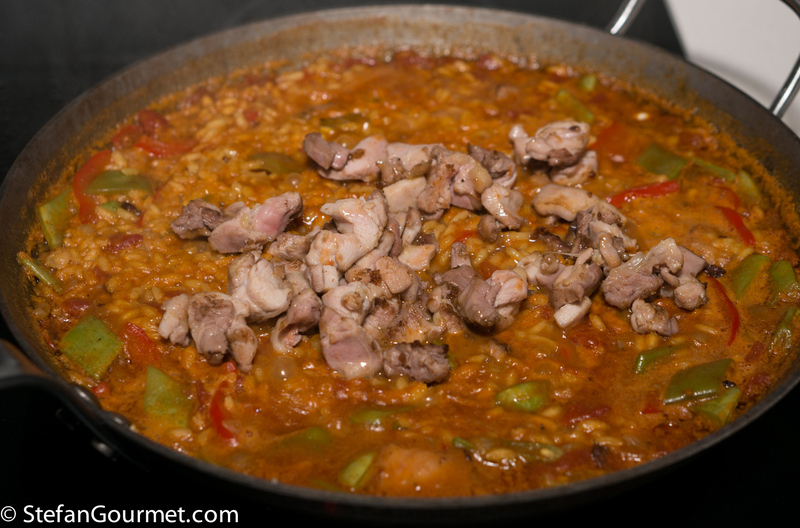 funny enough my latest blog post is a Paella as well (sorry for the chorizo…something i also address in my post 😉 ) Totally agree about timing the protein cooking time properly to avoid dryness and mealy textures. You still get an excellent socarrat if you do not stir the rice. I do not see it as a cheat, it’s an improvement. After all cuisine is not a static rule book. We learn and improve all the time as we should.